Pomeranian Dogs - The Pomeranian is a part of the German Spitz breed, and is a small dog in the toy dog breed. At an average of 3 to 7 lb (1.4 to 3.2 kg) according to AKC standards, the Pomeranian (Pom) is the most diminutive of the northern breeds. The head of the Pomeranian is wedge-shaped, making it somewhat foxy in appearance. The ears are small and set high. Its tail is characteristic of the breed and should be turned over the back and carried flat, set high. When born, the tail is not spread out; it may take months for it to grow over the Pomeranian's back, and flatten. 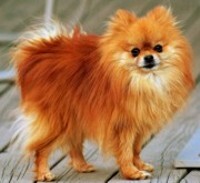 Beneath the Pomeranian's fur is a small but muscular dog, similar in appearance to a Chihuahua (dog). The Pomeranian is a very active dog who is intelligent, courageous, and a loyal companion. Pomeranians enjoy walking, and are fit for apartment life. They can be trained to be good watchdogs. The Pomeranian is confident, commanding, and outgoing. Due to the Pomeranian's small stature, they are not recommended for homes with small children as they may become temperamental. They make excellent watch dogs and will sound a bark when they sense danger. The Pomeranian is lively and eager to learn. They get along well with other household pets if given a slow and proper introduction. They make wonderful companions for families with older, well-behaved children and the elderly. The Pomeranian is a very sweet dog who adores spending time on laps or running around. Pomeranians often live 12-16 years. Some very healthy Poms have even been known to live 18-20 years. This information is licensed under the GNU Free Documentation License. It uses material from the Pomeranian article on Wikipedia.org. 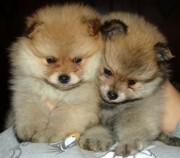 Pomeranian Breeders - Advertise your kennel puppies and dogs here.